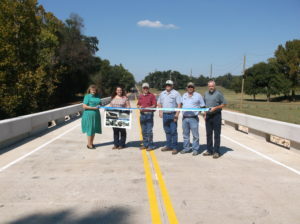 A ribbon cutting was held for the newly constructed Bridge #109 over Horse Creek on October 3rd at 1:30 pm, according to Commissioner Randy Robertson, Choctaw County District 2. The bridge was designed by Guy Engineering Services, Tulsa, OK. The original bridge was a 50 feet long girder span with a concrete deck and was classified functionally obsolete. The contractor, BridgeCo Contractors, Inc. of Wellston, OK, replaced the bridge with a 105 foot long Prestressed Concrete Beam span bridge. The new bridge will improve safety and accessibility for anyone traveling in Choctaw County. The bridge was constructed for $830,447, with funding provided by a combination of Surface Transportation Program (STP) Funds and Oklahoma’s County Improvements for Roads and Bridges (CIRB) Program.